We always say that Linux is more secure than other Operating Systems, in the way to provide port level security FirewallD is the best application. In Previous Linux versions we used iptables to provide port level security. Newer Linux versions firewalld is introduced with great features and enhancements. Actual background of iptables and firewalld works based on ipchains which are kernel inbuilt module. We are going to see firewalld installation configuration RHEL 7 port level security. IPtables are absolute. What is mean by port level security..? Now a days security plays major role in protecting the servers and its data from theft. A simple way to do packet filtering using firewalld inbuilt application. Allow / Deny incoming connections by writing firewall rules. In newer version of Linux such as RHEL 7 / Centos 7 and Fedora Firewall by default disables the port communication to clients except allowed. Lock down: White listing of applications that may modify the firewall. FirewallD is available in GUI and CLI as well, CLI tool is firewall-cmd. 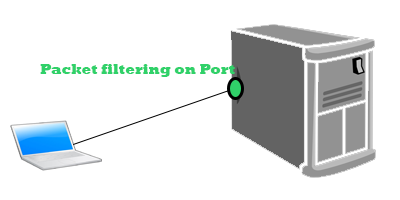 Using firewall we can allow particular port to particular network / IP Address, we can also deny particular port for particular network / IP address. In order to use firewalld as a default we have to disable iptables and ip6tables permanently to disable permanently do below steps, Stop services, Disable services and mask services. When you add mask to service if any other administrator tyring to start the services will not start until service need to be unmask. List all open ports, add/allow ports and remove/deny ports using firewalld in RHEL 7. We can add / remove ports to default zone are specified zone. After every add / remove we have to reload firewalld services to take effect. When we connect to 2080 port which request will be forwarded to 80 port. [root@server ~]# firewall-cmd --permanent --add-rich-rule "rule family=ipv4 source address=192.168.4.0/24 forward-port port=2080 protocol=tcp to-port=80"
Firewalld service will use ipchains to inject firewall rules. Firewall is used to enable port level security which will filter incoming and out going packets in newer versions of Linux such as RHEL 7 and Centos 7. In Ubuntu Linux there is no firewalld is enabled. Thanks for reading please do comment your feedback on the same.